Present personality types in visual diagrams. Create matrix diagrams in an easy to use tool. 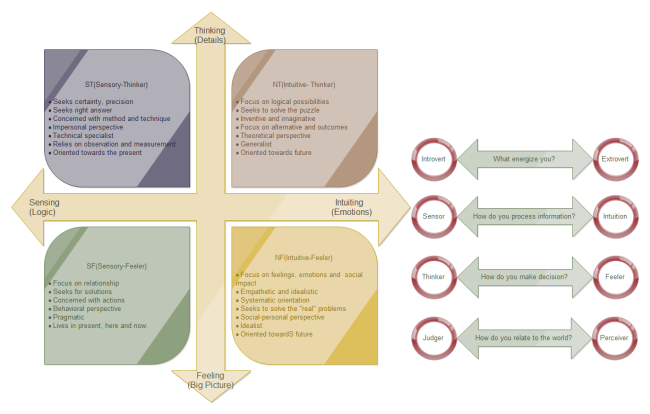 Download free matrix diagrams about personality and communication. It is well said that if you start communication with a concern for people, they listen. If you are able to use your own strengths and preferences, and in turn appreciate the others' strengths and preferences, it is possible to truly carry out better communication. Then the question comes: how can we know people's strengths and preference? Here is one simple solution, to learn people's personality. 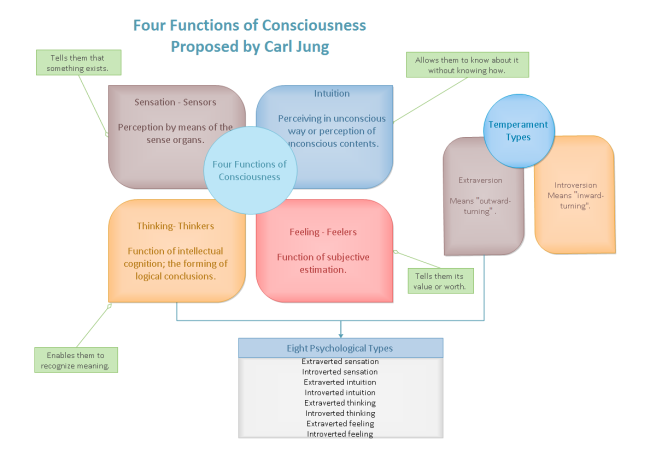 Carl Jung proposed four main functions of consciousness including 2 perceiving functions: Sensation and Intuition and 2 judging functions: Thinking and Feeling. intuition - perceiving in unconscious way or perception of unconscious contents. Thinking and feeling functions are rational, while sensation and intuition are non-rational. 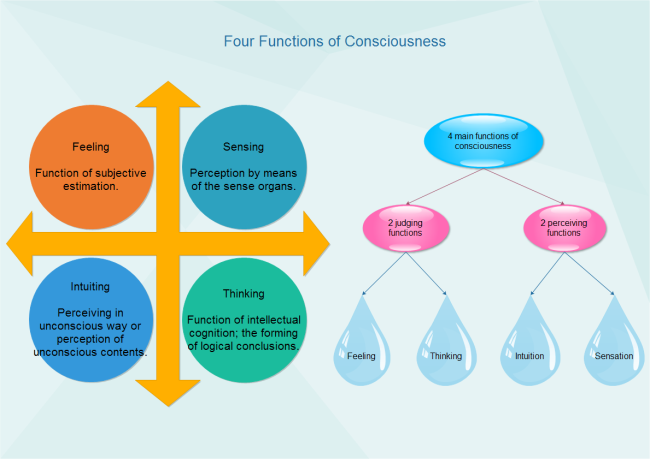 According to Jung's 4 functions of consciousness, people's features of personality fall into 4 categories as shown in the following matrix diagram. People differ and misunderstanding may occur. It is necessary to communicate in a more interesting and considerate way. To present information to intuitive type of people, show the big picture since they are rational. They want the main point. As reading they tend to read between the lines like abstraction and symbols. When presented with ideas, the sensor's natural reaction is to focus on the specifics and often identify what is missing. They are literal, and tend to look for the concrete data in any communication. When talking with feelers, the thinker should remember that feelers prize harmony and would prefer to agree, if given a chance. Therefore, we had better start a conversation with feelers by mentioning the points of agreement. Awareness of common points can help discuss, negotiate and eliminate differences in a mutually beneficial way. A feeler should emphasize logic and rationality in the conversation with thinkers. For thinkers, rules and logic prevails agreement. To initiate a discussion with thinker, a feeler may benefit from outlining a logical progression and allowing him to debate even without reaching consensus. Of course, the above mentioned skills are just a few of the relevant research results. In addition to the application into communication promotion, personality analysis can also boost learning and self-development. You can learn more about this topic in article: Infographics about Color Personality and Eysenck's Personality Types Theory. The matrix diagram below summarizes this page best in the visual way.